Jules Malétras is a thoroughly unpleasant man. He is a wealthy, retired businessman, tight-fisted and contemptuous of those around him. 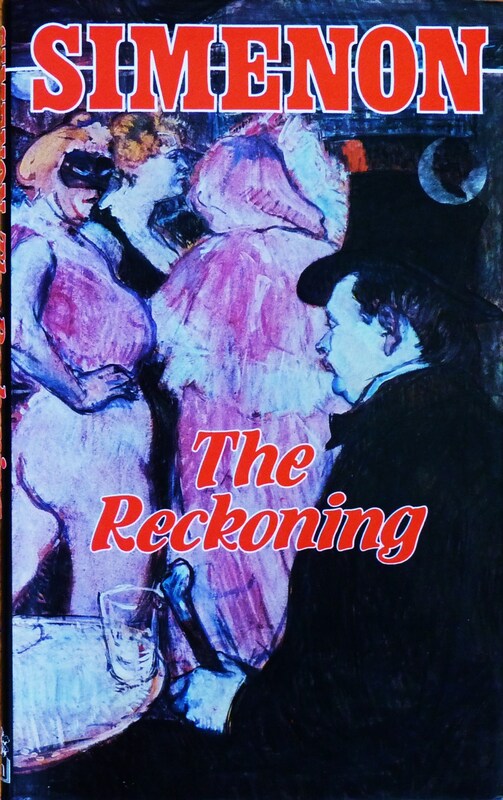 In the opening chapter of The Reckoning, he strangles his young mistress, Lulu, because she refuses to undress for him. It is not that he particularly desires to see her naked; rather, he is angered because she does not do his bidding – for the first time she has defied him. The murder is covered up by Lulu’s brother, and Malétras is free to continue his routine as normal. But, of course, all is not normal. As he walks the streets of Le Havre the following day, despite his ability to push Lulu from his mind, his previous existence seems unreal. ‘How could he define his uneasiness? He felt unsteady. More precisely, he felt he was outside reality.’ Yet, despite his wealth, Malétras has always existed on the margins. Every day he joins a group of fellow businessmen at a café, but while they play cards, he merely observes. He has no friends. He maintains a respectful, but cold relationship with his second wife, whom he has never so much as kissed on the mouth. The day after the murder, not knowing what to do with himself in the absence of his mistress, Malétras visits a grimy bistro where the slovenly patronne, Marie, offers him the services of a teenage girl. Malétras declines her offer (he has no sexual urges), but out of habit he returns to the bistro on the subsequent days. He comes to realise that what has draws him to this seedy part of town are the sights and smells which remind him of his late mother’s shop – the faded advertisements, stale sweets and decaying vegetables. It’s a familiar Simenon motif: the embittered, older man whose only moments of happiness come from a few, fragmentary childhood memories. But Malétras’ poverty-stricken childhood is not sufficient to explain his sociopathic nature. Simenon does not compromise in his portrayal of a character entirely devoid of redeeming features. On the day that he suffers a near-fatal heart attack, Malétras visits an old school friend, Gancel, whose wife is dying. He finds a family affectionate and caring towards one other. Malétras stares at them in puzzlement: ‘Why were they different from the others? He could not believe that it was goodness that united them , because he did not believe in goodness. Man is not good.’ Afterwards, he returns to the bistro, where he succumbs to the temptation to go upstairs with the girl, not because he desires her, but because he wishes to prove the patronne that he ‘was a man like all the others and did not need their pity.’ It is sordid and grim. [He] was alone. True, he had often been conscious of his own solitude. This time it was different. He realised how totally alone he was, he realised once and for all that man, whatever he does, is alone in life and death. It is unusual for Simenon to so explicitly suggest a generalised point of view in this way. But he could hardly be clearer: we are all on the same boat as the repellent Malétras. At the end, Malétras takes to attending church. His wife tells him that she knew he would ‘end up believing in God’, but it is not that. Malétras is only trying to recapture a moment, shortly before his first communion, when the smell of incense mingled with flowers made him weep with joy. The church performs the same function for him as Marie’s squalid bistro. The Reckoning is a serious and depressing piece of work. It is not without flaws, but in its uncompromising pessimism and refusal to countenance any facile rehabilitation of its protagonist, it deserves admiration, if not affection. First published as Le Bilan Malétras in 1948. UK edition published by Hamish Hamilton in 1948. Translated by Emily Read.